The central thrust by U.S. 36th Division commenced three hours after sunset on January 20. The lack of time to prepare meant that the approach to the river was still hazardous due to uncleared mines and booby traps, and the highly technical business of an opposed river crossing lacked the necessary planning and rehearsal. Although a battalion of the 143rd Regiment was able to get across the Rapido on the south side of San Angelo and two companies of the 141st Regiment on the north side, they were isolated for most of the time, and at no time was Allied armor able to get across the river, leaving them highly vulnerable to counterattacking tanks and self-propelled guns of General Rodt's 15th Panzer Grenadier Division. The southern group was forced back across the river by mid-morning of January 21. Maj. Gen. Geoffrey Keyes, commanding II Corps, pressed Maj. Gen. Fred Walker of 36th Division to renew the attack immediately. 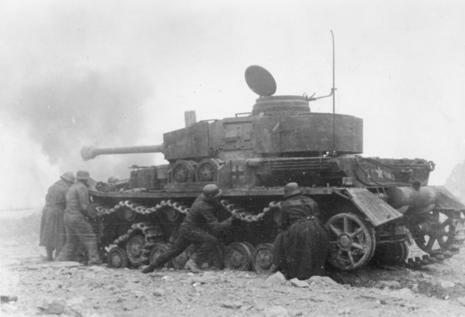 Once again the two regiments attacked but with no more success against the well dug-in 15th Panzer Grenadier Division: 143rd Regiment got the equivalent of two battalions across, but once again there was no armored support, and they were devastated when daylight came the next day. The 141st Regiment also crossed in two battalion strength, and despite the lack of armored support managed to advance 1 km (0.5 miles). However, with the coming of daylight, they too were cut down, and by the evening of January 22 the regiment had virtually ceased to exist; only 40 men made it back to the Allied lines. The assault had been a costly failure, with 36th Division losing 2,100 men killed, wounded and missing in 48 hours. 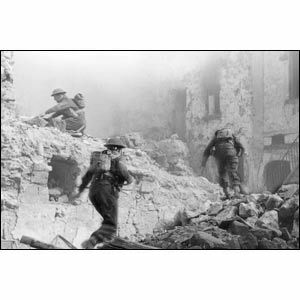 The bastion at Monte Cassino, Italy which was held by the Germans required a month long siege. Joining the final assault was the the 100th Infantry Battalion, composed of mostly Japanese American soldiers. Many of the soldiers in the 100th had families interned in concentration camps back home in the United States. The 100th Infantry Battalion was later 100th was incorporated into the 442nd Regimental Combat Team.